When it comes to supplements and acne, zinc is easily one of the most frequently discussed. Some people swear by it, while others (including many dermatologists) claim its a hoax. So what’s the truth? Can zinc help prevent and heal acne? Luckily, unlike many other supplements, we have real scientific studies that analyze the effects of zinc on individuals with acne, and the results are pretty surprising. In this article, we’ll take a quick look at what zinc does in the body, and then break down whether or not it helps with acne. Finally, we’ll cover the best type, dosage, and timing when it comes to taking zinc supplements for clear skin. Zinc is a pretty important mineral – it’s so important that it’s found in every single cell in your body. It’s also important to note that zinc is an essential nutrient that you need to get through foods or supplements. Your body does not produce zinc by itself. Needless to say, zinc is pretty important for your overall health, which is why it makes sense that zinc can help with acne too. Does zinc help get rid of acne? Zinc hits just about every root cause of acne. Zinc helps regulate apoptosis (the skin-shedding process), which prevents dead skin cells from clogging pores1https://www.ncbi.nlm.nih.gov/pubmed/10801960. Zinc is also necessary for proper immune system functioning2https://www.ncbi.nlm.nih.gov/pmc/articles/PMC5490603/, a key component of inflammatory acne. Zinc assists in the absorption and transportation of vitamin A, a crucial nutrient for clear skin. Zinc may improve sleep3https://www.ncbi.nlm.nih.gov/pmc/articles/PMC5713303/. Inadequate sleep can lead to high cortisol levels (stress hormone), triggering acne. Best of all, we actually have studies that show just how effective supplementing with zinc can be for treating existing acne. Another study conducted in 2001 put zinc head to head with antibiotics (minocycline) over a 3 month period. The success rate was 31.2% for zinc and 63.4% for antibiotics after 3 months. It’s worth noting that while zinc may not have been as effective as antibiotics, it comes without all the dangerous side effects. Many people (including myself) find their acne coming back stronger than ever after a few months of antibiotics. Why? Because antibiotics don’t just kill acne-causing bacteria, they also kill the good bacteria in your gut, rendering your digestive and immune system weaker than they were before antibiotics. Unlike antibiotics, zinc is safe for your gut microbiome (it’s found in almost every plant and animals on earth) and also beneficial for your long-term digestive and gastrointestinal health. Putting it all together, zinc stands alongside vitamin A, vitamin D, and omega-3 fatty acids when it comes to healthy, glowing, beautiful skin from the inside-out. Zinc is a safe, effective, and affordable way to treat acne. But what if I told you that you’re probably not getting enough zinc? It might seem like getting enough zinc is easy. Sesame seeds, pumpkin seeds, lentils, beans, cashews, quinoa, and even tofu are all loaded with zinc, so what’s the big deal? Why would you ever need to supplement with zinc? While it’s true that all of these foods are high in zinc, these foods are also high in an antinutrient known as phytic acid. 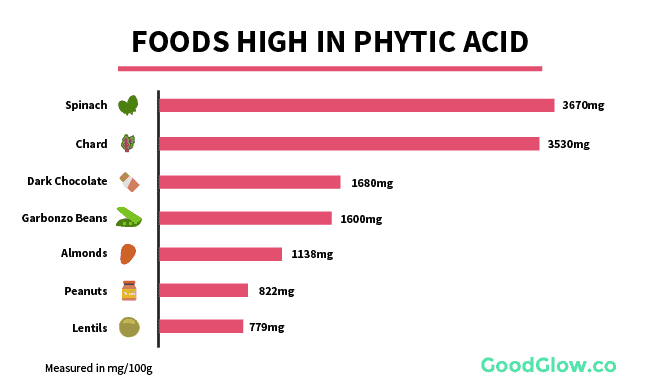 Phytic acid prevents zinc from being absorbed properly and can make it nearly impossible for you to get enough zinc through your diet alone5https://academic.oup.com/jn/article/130/5/1378S/4686381. Foods high in phytates include grains (wheat, corn, rice), legumes (lentils, beans, soy), nuts, seeds, dark chocolate, and even some vegetables, like raw spinach and chard. The worst offenders are usually whole grains, including bread, pasta, and baked goods. So while you might be getting plenty of zinc through these plant-based sources, odds are, you’re not absorbing a whole lot of it. High phytate intake, along with excessive carbohydrate consumption, may be a reason that diets that rely largely on whole grains lead to higher levels of acne. 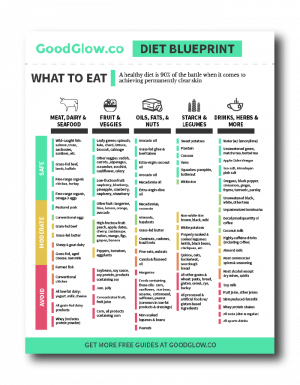 If you’re struggling with acne, I’d recommend following the free GoodGlow Diet Blueprint, which helps you avoid the foods high phytates and other antinutrients that can prevent nutrient absorption. It’s also worth noting that dairy can also have a negative effect on zinc absorption6https://www.ncbi.nlm.nih.gov/pubmed/10801947, although the effect isn’t as severe as phytates. If you’re reading this article and have acne, you should probably consider either altering your diet to be more zinc-friendly or begin supplementing with high-quality zinc. Unless you fit into one of those two buckets, it probably wouldn’t hurt to consider adding a zinc supplement to your routine. But with so many of them out there, what type of zinc and how much should you take? 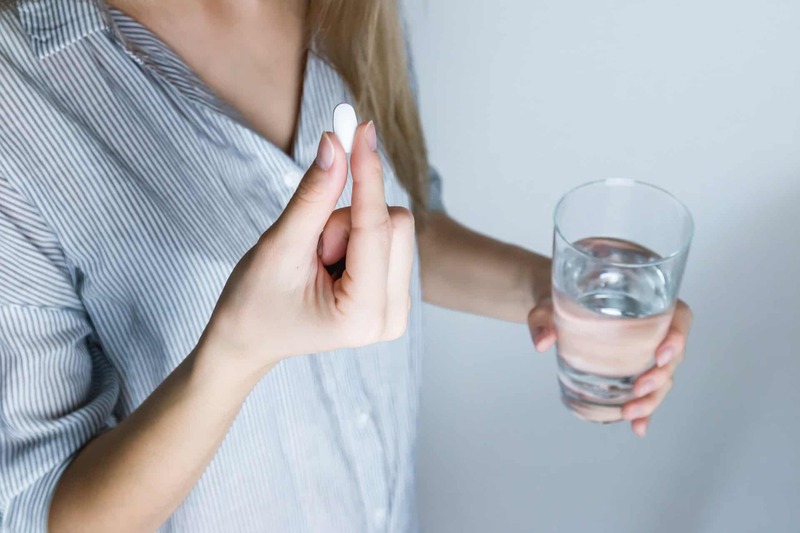 There are 3 main considerations when it comes to picking a zinc supplement for acne: the type of zinc, the dosage, and when to take it. If you search for a zinc supplement, you’ll quickly find that there are a million different types of zinc out there. Zinc gluconate, zinc picolinate, zinc sulfate, zinc citrate – which one is best for acne? I personally choose to go with zinc picolinate and have experienced the best results using the Thorne Research brand. The best dosage of zinc for acne depends upon whether or not you’re currently deficient in zinc. While healthy individuals won’t want to consume more than 40mg of zinc per day, individuals who are deficient in zinc might benefit more from higher doses. Some of the common symptoms of zinc deficiency are acne, eczema, dry skin, and dandruff. The studies I mentioned earlier that found zinc to be effective at treating acne actually used pretty high doses of zinc, typically over 100mg per day. I personally take between 20mg and 70mg of zinc per day, depending on what my diet looks like. Right now I’m studying abroad in Italy, the land of phytates (and carbs), so I supplement with more zinc than I normally would (75mg). At home, when I’m on the carnivore diet, I’ll sometimes skip zinc supplements altogether. It really depends on your diet and current needs – I’ve found that 30mg/day is usually a decent starting place for acne. Unlike certain nutrients, zinc is quickly flushed out of the body and needs to be consumed on a frequent basis. For this reason, I take zinc every day, and generally on an empty stomach. One study found that roughly 65% of a zinc supplement was absorbed in fasted individuals, versus only 33% when consumed with food10https://www.ncbi.nlm.nih.gov/pmc/articles/PMC3724376/. For some people this can cause discomfort, so feel free to take zinc with food if this the case. If you do need to take zinc with food, try to take zinc outside of meals that are high in phytates (beans/legumes, grains, nuts, seeds, dark chocolate, etc.). Zinc is an essential nutrient needed for everything from DNA synthesis to digestion. Zinc helps stop several of the root causes of acne. It regulates the skin-shedding process, reduces inflammation, makes vitamin A more effective, aids the digestive system, and even improves sleep. Several studies have shown that supplementing with zinc can be an extremely effective, natural way to treat acne. Our bodies are unable to produce zinc by themselves, we have to get it through food. Unfortunately, most plant-based foods that are high in zinc also contain phytates, which prevent zinc from being absorbed. Animal foods high in zinc include oysters, lamb, beef, and shrimp. Unless you’re eating a diet low in phytates and rich in meat, you may want to consider supplementing with zinc. 30-60mg per day of high-quality zinc picolinate may be effective at treating acne in zinc-deficient individuals. Have you tried using zinc for acne before? How did it go? Do you have any questions? Drop them in the comments below and I’ll do my best to answer them! Your Plant-Based Diet is Giving You Acne. Here’s how to fix it.